July 5th.... Well, all good things --- or all good luck --- must come to an end. Today I had a tiny bit of a frustrating, panicky day. It all worked out in the end, but for a while there, I was in a pickle. The day started out fine enough. I had glued the two peghead ears onto the peghead the previous night, and today I sanded the ears flush to the rest of the peghead. Next I proceeded to make the fingerboard. 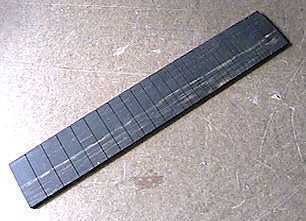 I had bought a pre-slotted mandolin fingerboard from Stew-Mac. Following Siminoff's instructions, I traced his drawing of the fingerboard outline onto my fingerboard blank and cut it out with the bandsaw. It came out perfectly, just like the drawing! 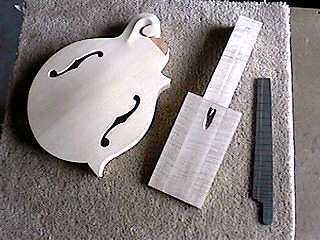 Next, I drew the outline of the fingerboard onto the neck surface, as Siminoff directs in the book. I also traced and drew the outline of the heel onto the neck blank. And I proceeded to carve the neck, carving almost up to the drawn lines and using five templates to check the contour of the neck at various points. 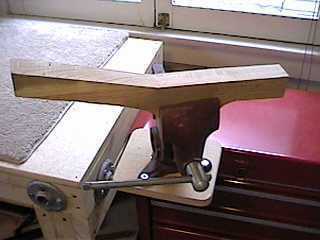 Here's the neck-holding jig I made out a piece of scrap 2" by 6" wood. 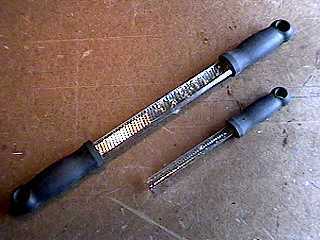 The tools pictured here proved to be really effective ---- the ones above are called "micro-rasps". They're great! They have lots of tiny cutting teeth, and they never clog because one side is open. 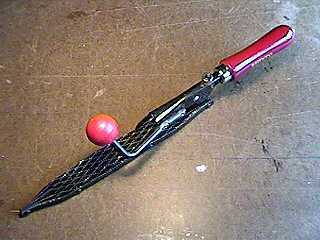 The two-handled one works like a drawknife; you can either pull or push it. The little one has about a 1/2" round shape. It works great for curved areas and for general shaping. This tool is a Japanese saw-rasp; it is basically just a bunch of sawblades attached together; one side is coarse, and the other side is fine. Now for the little problem I had.....After I had rough-carved the neck, I set the fingerboard up on top of the neck, to see what it looked like. 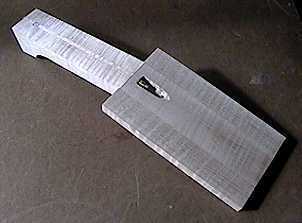 And I realized that it didn't account for the extra width of the binding that I would later put on the fingerboard!!! At first I panicked and thought, "Oh, no --- the Siminoff drawings and measurements for the neck surface outlines were all wrong (too narrow)!!! 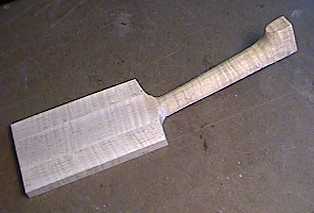 I'll have to make a new neck (I had already carved the neck just about up to the drawn lines)!!! I don't want to go through all that trouble (and expense) again! What do I do????" I definitely was not a happy camper. After panicking for a while, checking and rechecking the Siminoff book for any clues as to what went wrong --- and after checking my neck's width against a Stew-Mac Don Macrostie F-5 blueprint --- I finally came to the conclusion that my neck width was correct. I think it was the Siminoff drawing of the fingerboard that I misunderstood. 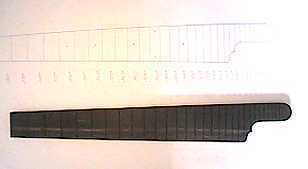 I think Siminoff either drew the fingerboard outline too large, or just forgot to mention that the fingerboard outline is the outline of the finished, bound fingerboard, and not just the fretboard itself. Maybe I should have realized that myself. A note next to the drawing would have helped, though, for those of us (like me) who don't always think too clearly. After I came to that conclusion, I measured my .040" white fingerboard binding and simply took that much off each side of my fingerboard with my disk sander. Problem solved...I hope.